Congressman Henry Waxman shows 'em how to harness a shifting political wind. In November, Democrats in the U.S. House voted to replace the longtime chairman of the powerful Energy and Commerce Committee, John Dingell of Michigan, with Los Angeles liberal Henry Waxman. This election wasn't followed anywhere near as closely as Barack Obama's a couple weeks earlier, but it was another clear indication that the nation's political priorities were shifting. Dingell is the dean of the House—he's served 27 terms since 1955—and widely admired for his loyalty, bluntness, and formidable political skills. But he was also the biggest obstacle in Congress to passing clean-air and climate-change legislation, since he'd always used those skills to protect Detroit automakers from regulation they deemed onerous. Waxman is hardly an upstart, having entered Congress as part of the reform-minded "Class of '74" sent to Washington after Watergate. In 35 years in office he's developed his own reputation as a shrewd operator with an unyielding commitment to progressive causes such as AIDS funding, tobacco regulation, and environmental protection. His ascent to the Energy and Commerce chairmanship signaled that the Democrats were eager to deliver on their promise to confront environmental issues, even if it meant dumping a respected elder. And it offered Waxman a hook on which to hang his entry in a literary genre that no amount of public indifference can seem to kill: the congressional memoir. As politicians at all levels have explained to me, you don't get into the business if you don't believe you have something important to say. But that doesn't mean you actually do, and it certainly doesn't mean you're able to express it in terms that others will find interesting or readable. Of course, sometimes readability is beside the point. In 1989, then-House speaker Jim Wright was forced to resign over allegations that staffers pushed his supporters to buy his Reflections of a Public Man—which one of his political consultants had published, giving him an eyebrow-raising 55 percent royalty rate—in bulk. "You know, I wanted to get the widest possible distribution of the—of the book," Wright told his colleagues during his resignation speech. "It's probably not great literature, but I like it." On the opposite end of the spectrum is John Lewis's 1998 work, Walking With the Wind, an engaging account of how he went from a sharecropper's kid with a debilitating stutter to a leader of the civil rights movement and, eventually, a congressman. 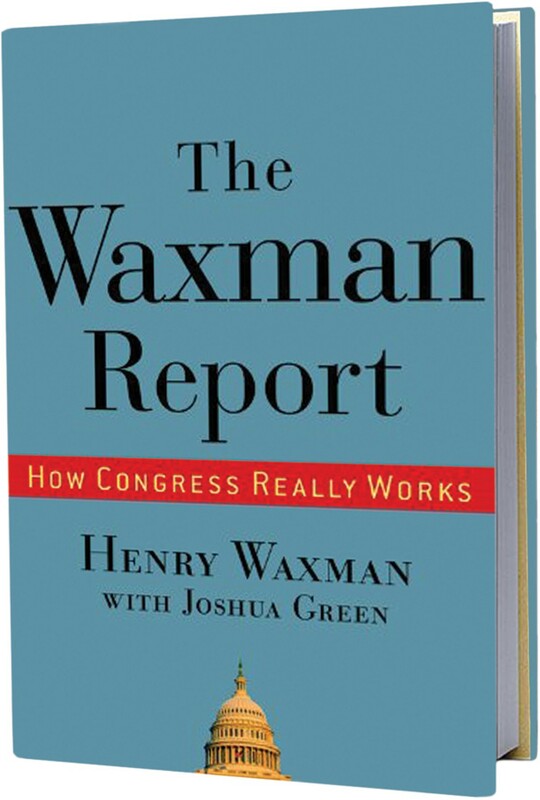 The Waxman Report isn't as elegant as Lewis's book, but it's timely. 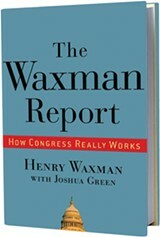 Assisted by Joshua Green, a senior editor at the Atlantic Monthly, Waxman has written an informative, fast-moving manifesto against the gut-the-government politics that have been in vogue since the Reagan administration. The shortsightedness of the right isn't exactly an original theme, but given the recent attacks on Barack Obama's "socialism," the country arguably still needs to hear how government can help. "Like so many of his generation, my father was scarred by the Great Depression," Waxman writes early in the book. "But his view of government, which he imparted to me, was unremittingly positive. He believed that it was a tremendous force for good and could do still more." In contrast, he declares, after describing last fall's congressional hearings into the economic collapse, "the reckless greed of Wall Street, the regulatory failures, and the extraordinary waste, fraud, and abuse uncovered in our hearings share a common origin. They all stem from an ideology that holds that government intervention is inherently harmful and private sector actions are inherently good." The book roughly follows the course of Waxman's political career, from his start as an activist and state legislator, but it's not really about him or the people he's met. He's more interested in telling the stories of the legislation he's worked on. In places that can be as dry and wonky as it sounds, but it's also a surprisingly compelling and insightful way to show how shrewd politics can produce good policy. But Waxman and his allies figured out how to win anyway. After a chemical leak at a Union Carbide plant in Bhopal, India, killed thousands of people, they organized hearings on environmental safety near a troubled Union Carbide plant in West Virginia. They highlighted the effects of air pollution on national parks. And they released previously unpublished data showing that billions of tons of unregulated toxic chemicals were emitted by U.S. companies every year. One by one, the Dingell and Reagan initiatives stalled as support wavered, and by 1990 Dingell and the George H.W. Bush administration were compelled to join liberals in crafting historic amendments to toughen the Clean Air Act. The Waxman Report offers a reminder that the political winds shift constantly, and that skilled politicians—pushed along by engaged voters—catch them when they can. Here in Chicago, it's probably too much to hope that most City Council members would check this book out, let alone cull some lessons from it. But maybe it can help some voters understand that the status quo—inside deals, lack of imagination and debate, rising taxes and declining services—doesn't have to stand. Waxman doesn't get to it in the book, but this spring he shepherded another groundbreaking piece of legislation through the House: the American Clean Energy and Security Act, which is designed to slash greenhouse-gas emissions by 80 percent over the next 40 years. The bill is flawed, and likely to get watered down even more than it already is in order to get through the Senate, but even if it dies this time, something like it is almost certain to become law in the next year or two—an astounding fact, considering that it wasn't long ago that top Bush administration officials denied that climate change existed, and top Democrats couldn't find the will or the way to take them on.